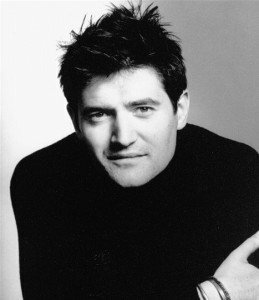 At the time of this interview Tom Chambers was starring as Jerry Travers alongside Summer Strallen as Dale Tremont in Top Hat at the Aldwych Theatre in London’s West End. From an early age Tom has always loved to dance, and growing up watching Fred Astaire and Ginger Rogers’ films was just the inspiration that he thrived on. As well as on stage Tom has also shown his talent on screen, playing a leading role in Holby City, and then winning Strictly Come Dancing in 2008 with partner Camilla Dallerup. As well as having his dream role in Top Hat, Tom also gives of his time as he is patron of the National Youth Music Theatre and also Ambassador for the children’s charity Starlight. Tom recently took time out to answer some questions about himself and his career. Enjoy! You were born in the village of Darley Dale in Derbyshire. How did you first become interested in dance? From as far back as I can remember, I used to stamp on the kitchen floor long before I even knew what tap dancing was. And growing up, I would watch all those classic Hollywood Sunday afternoon matinee films, many of which of course were Fred Astaire and Ginger Rogers’ films, and I was completely hooked and inspired. So at school I use to go to one tap class a week and then practice in the school toilets because there was a good sounding floor. You were a member of the National Youth Music Theatre (NYMT) and then graduated from the Guildford School of Acting. How did those establishments prepare you for a professional life on stage? NYMT was invaluable. Good grounding and solid team work. Also got us out of the house during school holidays. GSA was then the professional foundation for technique which was to prepare me for working in the industry. However – most of the work only comes from you yourself. I quickly learnt that you had to be the one putting in the effort to gain any results. You have appeared in several films and also on television, including Sam Strachan in BBC1’s Holby City. Did you enjoy working in front of a camera rather than on stage and what was it like appearing in a national drama series? I love working on camera because you work on the story directly and get the chance to explore many different options and then the director can decide in the editing room which one best suites the pace of the show. You also get many location possibilities which open up lots of variety. Holby City was an incredible show to work on. Such a huge following, great writing and lots of skilled fake operations! What made you recreate Fred Astaire’s solo tap routine from the 1937 film A Damsel in Distress which took nine months of practice? My agent had fired me for not accepting Bob The Builder Arena Tour and therefore in order to try and attract a new agent I thought it would be a good show piece if I could get on the Royal Variety Show. That then never happened because they were full up so I recorded it on stage at my old school and sent out a thousand copies on DVD which bizarrely got me an audition at Holby City because they were looking for an American doctor and even though there was no dialogue on the tap dance, they knew Fred Astaire was American so thought I must be American too! They then told me to audition for Sam Strachan which was a bigger part. Partnering championship dancer Camilla Dallerup, you won Strictly Come Dancing in 2008. How demanding was the training for the show and what did it mean to you to win the show? It was totally and utterly all-consuming mentally and physically. It was five months of seven days a week… however it was the most amazing experience you could possibly wish for and was a once in a lifetime opportunity. It was thrilling, unimaginable and a joy to win the show not only because it is humbling and staggering to think of all that support from the public voting for you to keep you going but because of what it also meant to Camilla. The pro-dancers work so hard with so much patience starting every week on a new dance that to them it is the reward for so much endurance and teaching ability. You are currently starring as Jerry Travers in Top Hat at the Aldwych Theatre. How would you describe your character and how have you tried to make the role your own? Jerry is happy go lucky. He has the whole world at his finger tips and literally floats his way through life being a global entertainment star. He has a cheeky witty sense of humour and loves chasing the ladies. I have tried to make sure there is a real sense of character behind the stardom. In many ways I just try and make what he is saying truthful as well as entertaining for the audience. There are many incredible dance scenes in Top Hat, which is your favourite and why? I love No Strings because Jerry is just carefree dancing around the hotel room toying with Horace his producer friend and then also Isn’t it a Lovely Day because both dances have mostly the original choreography from the film which is a sheer joy to dance. What do you think makes Top Hat such a successful show and has made it last the test of time? One of the important parts is the dialogue between the six main principals. It makes the show not just lovely to look at but the audience can connect with what they are saying and relate to the conversations between them. The test of time is down to the fact that Irving Berlin’s songs are still a joy to listen to and Fred Astaire’s choreography is simply the best in the world for that Golden Hollywood 1930s period. Fred Astaire has clearly made a huge impact on you, when did you first discover the great man and his work, and how has he influenced your career? I watched his films constantly from the age of ten upwards. I love his dancing style, his imagination and choreographic creativity. He is the reason I have fought for so long to work in this industry. He has kept me going and he is responsible for me getting my first big break. How important is it to you to be able to ‘showcase’ Tap Dancing to a West End stage? Tap dancing is pure joy. It is playing the drums with your feet and I like to think of it as dancing tap rather than tap dancing. To dance and make sounds with your feet at the same time in so many different ways. People seem to love it when they see it so it is a delight to be able to bring this entertainment to the West End. Why should everyone come and see Top Hat? People should come and see Top Hat because it is a once in a lifetime opportunity….. unless they book to come to see it twice. It’s live theatre with all three styles for everyone’s enjoyment: uplifting witty dialogue, live music with singing, and Fred Astaire and Ginger Rogers dancing. What is it like backstage on Top Hat? It’s organised chaos! Lots of quick changes into costumes, and plenty of sets being moved to new positions. However, it runs like clockwork… most of the time… and there is always a good buzzing atmosphere with the pace of the show always moving us forward with little time for breath. You are patron of the National Youth Music Theatre and also Ambassador for the children’s charity Starlight. How important is it to you to be able to ‘give something back’ to the arts and to help others? For me it is mental medicine. We all need inspiration, enjoyment in our lives and an occupation to keep us going. Theatre is all those things whether you end up working in it or not. Seeing that the world is a stage you are prepared for it on the outside if you dabble in the theatre and the arts and for Starlight it’s an example of the escapism we all need when we are struggling. I hope I can carry the torch forward during darker times for others. You have a son William who is one year old. Would you like him to follow you in your footsteps? That’s a tricky one. I would never wish to place any expectations. He will find his own individual interests but if he does bend towards the arts then I hope I can give him some people to work with which I’ve had to find. Whatever he ends up doing we can only be there for guidance and encouragement and give our best support. What do you like to do to chill out away from the stage? I like to walk outdoors, open water swim in rivers or the sea whatever the time of year (!) but mostly relax with family and chat around the table with some hearty grub. What message to say to your supporters? Thank you for being there. Thank you for watching, and thank you for sending me messages of support and your appreciation which helps me to continue during those big moments of doubt and uncertainty! Many thanks Tom for a super interview and best wishes in Top Hat!